Screen grab of grievance form filed by 9-1-1 Director Bernard Brown. Commissioner Brown recently, on social media, released a copy of a disciplinary action that Bernard Brown received from County Administrator Steve Rapson. Commissioner Brown maintained that he was within his right to release the information, adding that he did not violate state law. Commissioner Brown’s disclosure was part of a larger commission meeting topic where he alleged a cover-up of issues at the 911 Center. The grievance said that Commissioner Brown subsequent to that meeting violated the policy. The grievance letter provided samples of Commissioner Brown’s social media posting of a county document relating to a disciplinary action the 911 Director received from Rapson. 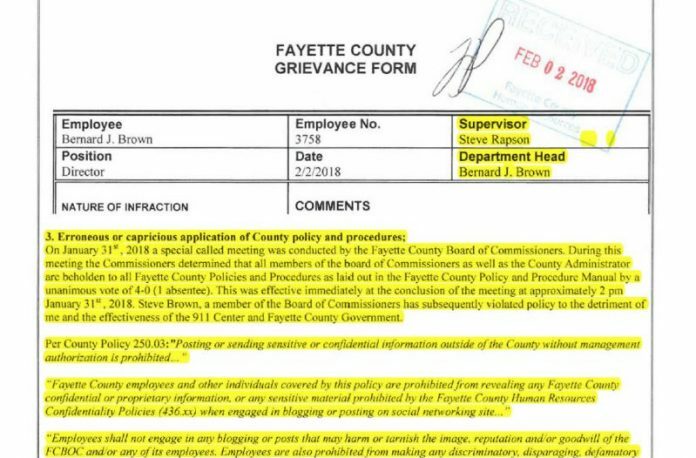 Bernard Brown’s grievance letter states, “The documented policies in conjunction with Fayette County Ordinance show that a commissioner, acting alone, may not send any confidential or sensitive information to outside sources, defame the character of an employee or dispense any personnel information through social media or to an outside source. 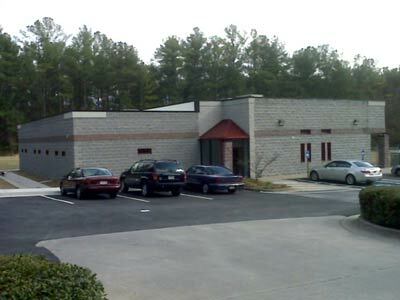 “The commissioner in question states that Georgia State Law protects him when releasing sensitive and confidential information but this is a misrepresentation of the law for open records. Fayette County government is required to have a process and designated personnel responsible for releasing Open Records. 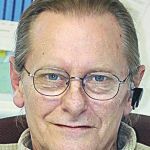 Such a policy exists and is adhered to, however, the commissioners of Fayette County are not part of the process as laid out in county policy, and even if they were, would require at least three votes to take action. Here’s The Citizen story from two years ago announcing Brown’s hiring. Fayette County has hired Bernard Brown to be director of the county’s Consolidated E911 Center. He has more than 30 years of experience in public safety with an in-depth knowledge of all facets of 911 operations. Brown began his career as a dispatcher in Buffalo, New York and currently serves as a regional coordinator of (21) twenty-one 911 centers in Virginia. He has overseen city and county 911 operations in Virginia and has experience with emergency medical and emergency management operations as well. Brown holds numerous certifications from both the National Emergency Number Association (NENA) and the Association of Public-Safety Communications Officials (APCO) organizations and serves as an adjunct instructor for APCO. He is also the immediate past president of NENA. Brown will begin his new assignment Aug. 24 at the Fayette County E911 Center which is the public safety answering point for all of Fayette County and handles dispatch responsibilities for the Fayette County Sheriff’s Department, Fayette County Fire and Emergency Services, Fayetteville Police Department, Fayetteville Fire Department, Peachtree City Police Department, Peachtree City Fire and EMS, Tyrone Police Department and the Fayette County Marshal’s Office. Brown replaces Cheryl Rogers who served as director of the consolidated center since its inception in 1995 and retired from the County in March of 2015 with 35 years of service. Previous articleDoes your faith make Jesus marvel?